The Eden Book Society was a private subscription publisher founded in 1919. For almost a century, it published horror novellas, always under pseudonyms. Now, the people behind Dead Ink Books have acquired the rights to the Eden Book Society’s backlist. This year, they are reissuing the six titles that the Society published in 1972; the first to appear is Holt House, by the mysterious L.G. Vey. Somewhere in the Hampshire countryside, in the middle of the Holtwood, live old Mr and Mrs Latch. Ray watches them through a hole in the fence: as a child, he was taken to stay with the Latches one night when his mother fell ill. Mr Latch showed him something that was stored in the wardrobe; Ray can’t remember what it was, but the experience has blighted his life ever since. Now, as an adult, he has returned to Holt House to find out exactly what happened. When Mr Latch dies suddenly, Ray seizes the chance to befriend Mrs Latch and find his way into the house. Of course, all is not as it seems. 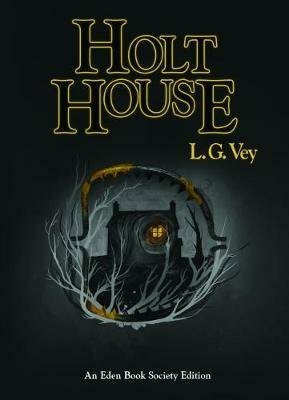 Ray finds that life at Holt House has a curiously timeless quality; a real sense of eeriness develops as Vey unveils this. But where the novel really shines is its exploration of Ray’s character: the realisation that he’s not entirely sympathetic, and the queasy to-and-fro of whether the tale’s real source of horror is setting or protagonist. It would be nice to maintain the pretence, but I think I should be honest: there was never really an Eden Book Society, and Holt House does not originate from 1972. The Society is a publishing project from Dead Ink, and was initially funded via Kickstarter (they’re now offering subscriptions through the Society website, linked at the start of this post). However, the books are being published anonymously: Dead Ink have announced that this year’s novellas are by Andrew Michael Hurley; Aliya Whiteley; Alison Moore; Jenn Ashworth & Richard V. Hirst; Gary Budden; and Sam Mills. That’s a fine list of writers, and what really got me excited about the Eden Book Society in the first place. I don’t know who’s writing behind the name L.G. Vey, and it doesn’t matter: Holt House is a strong start for the Society; I can’t wait to see what’s next. Holt House (2018) by L.G. Vey, Eden Book Society, 101 pages, paperback (source: personal copy). This one does sound splendid, as does the Eden Book Society project as a whole. I wonder if they’ll be available over here . . .? Off to look. Oops — forgot to tick da liddle box. I think it’s one you’d enjoy. I’m not sure if they’re available outside of subscriptions yet, but I would assume they will be at some point. What a fortunate coincidence! I hope you’ll enjoy it. I read it in one sitting this weekend, and I did rather enjoy it. I thought it got distinctly creepy as it went on, and not for the reasons I expected it to. I’d say more but it would be easily spoiled I think.